From today’s Toronto Star, a report on TVO’s Steve Paikin’s interview with former Progressive Conservative prime minister Brian Mulroney, who goes out of his way to withhold praise from Stephen Harper. He does, however, offer effusive praise for the other party leaders, even saying that the Liberals could win this election under Michael Ignatieff. Ouch. 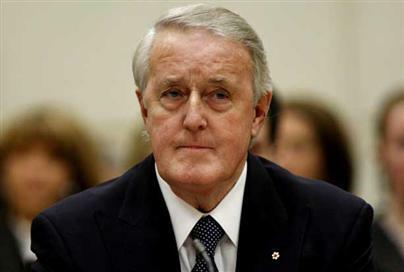 He also praises former Liberal prime minister Lester Pearson, whom Mulroney cites as an example of how much a minority government can accomplish. Double ouch. “You’re voting for Mr. Harper, I take it,” said Paikin, coincidentally the moderator of Tuesday’s English-language leaders’ debate. Although the architect of decisive Progressive Conservative victories in 1984 and 1988 conceded that Harper is “clearly a competent Prime Minister,” his unease with the current Tory leader was barely concealed. He praised Liberal Leader Michael Ignatieff (“an intelligent man, hard-working guy”), NDP Leader Jack Layton (“an outstanding leader of his party”), and even Bloc Québécois Leader Gilles Duceppe (“respected in Quebec”), whose party began in 1990 as a separatist offshoot of Mulroney’s Tories. This entry was posted in Canada, Current Events, Politics on April 11, 2011 by Michael Happy. The trial of Adolf Eichmann began in Jerusalem on this date in 1961. This entry was posted in Anniversaries on April 11, 2011 by Michael Happy.